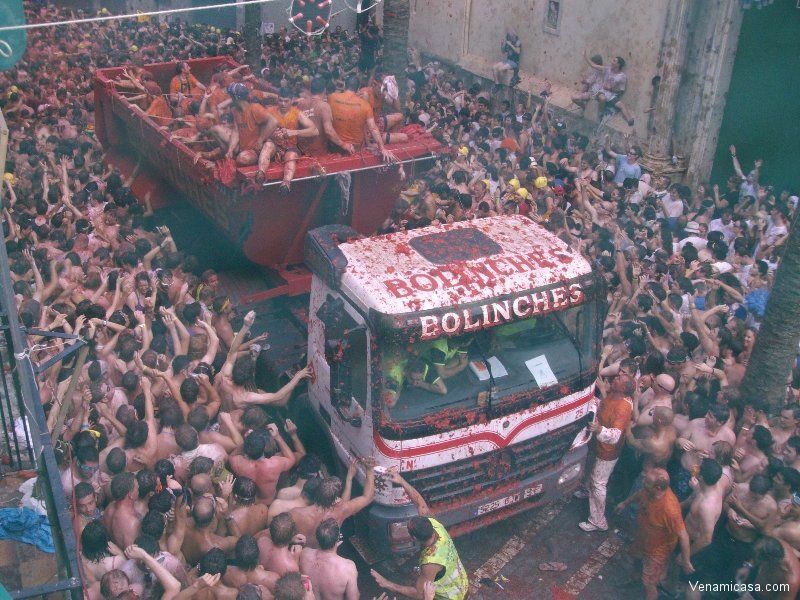 La Tomatina de Bunyol. Tomato’s Festival. 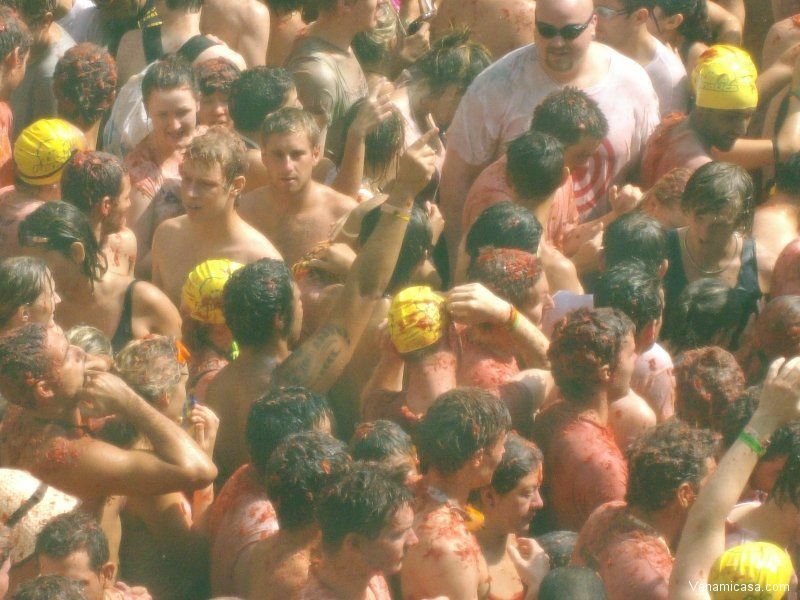 LA TOMATINA, TOMATO FESTIVAL: International Fiesta of Tourist Interest. 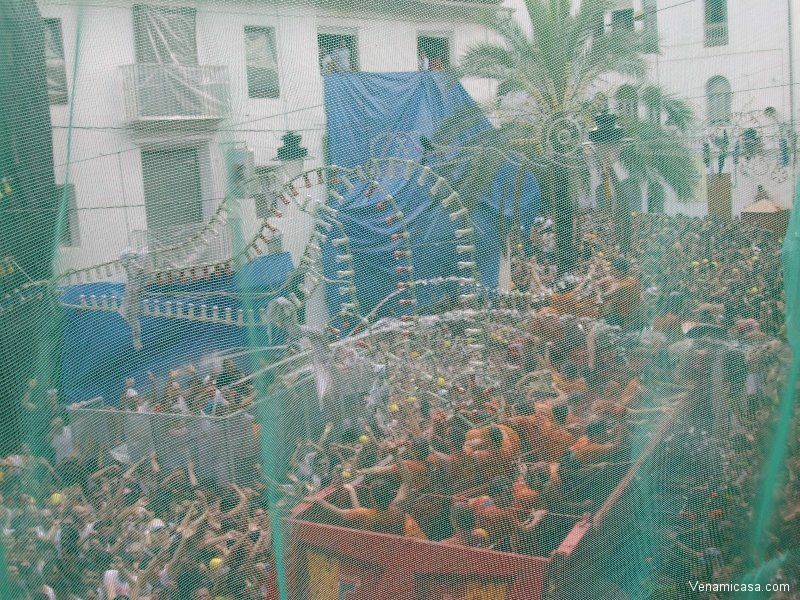 Bunyol (Valencia) celebrations are from 14th to 31st of August. On 24th will begin the Tomatina Village activitates with music concerts and DJ’s sessions. On 25th of August Buzz!, the popular PlayStation quiz game, is hosting its World Championship Final at Tomatina Village and the NONSTOP session that it will precedes the Tomatina act at the last Wednesday of August. Tomatoes arrives to Bunyol with lots of fun and music. It all started on the last Wednesday of August 1945, when some young people were getting fresh air in the town square. The evening did not promise much, so they decided to form part of a parade that was taking place with musicians and carnival figures of giants and enormous headed individuals. The impetus of their entry caused the fall of a participant who full of rage, began to hit everyone in his way. By a quirk of fate, there just happened to be a stand of vegetables beside them. The angry crowd started throwing tomatoes at each other until the public law put an end to the vegetable battle. The following year, the young people repeated the tomato fight on a voluntary basis and brought tomatoes from home. Although the celebration was dissolved by the police during the following years, the boys, without knowing it, had made history. 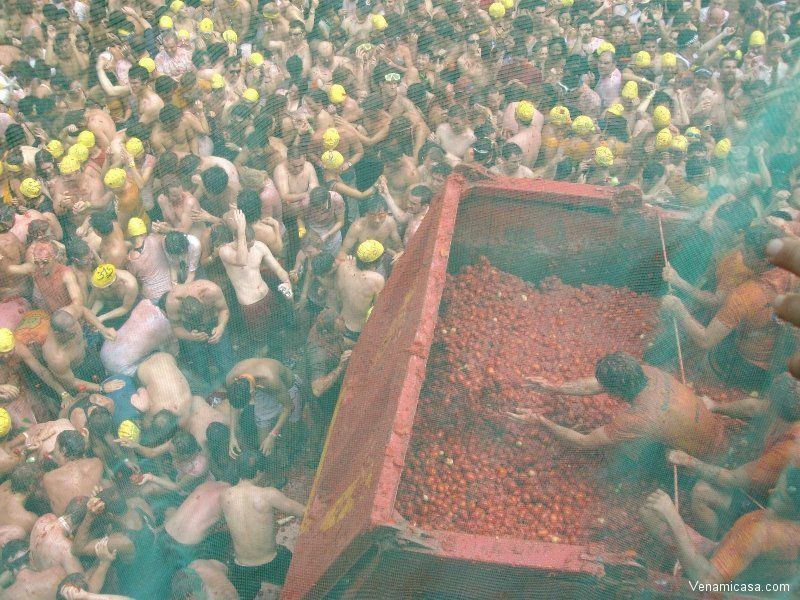 La Tomatina was banned in the early fifties, although this fact did not dissuade participants, eventhough some were arrested. But the will of the locals was heard and the celebration returned, more people took part in it and it became increasingly wild. Again the event was canceled until 1955, when, in protest, the Burial of the Tomato was held: an event in which residents carried a coffin with a big tomato inside. The parade was accompanied by a music band playing funeral marches, and it obtained a complete success. 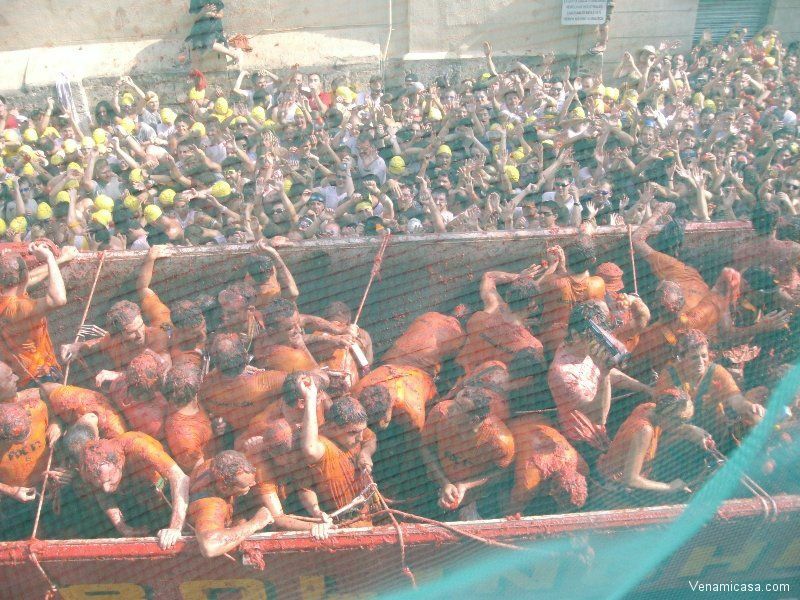 Finally, in 1957 official permision was granted and La Tomatina festival was formaly established. After that it has been the City Councils of the municipality themselves that have organized and promoted this curious battle, that has made Buñol world famous. The festival became popular in the rest of Spain thanks to Javier Basilio who, showed the event in a television program Informe Semanal “Week report” on Spanish TV. Since 1980, it has been the different City Councils that have supplied the tomatoes to the participants, which year after year, increase in number and enthusiasm. 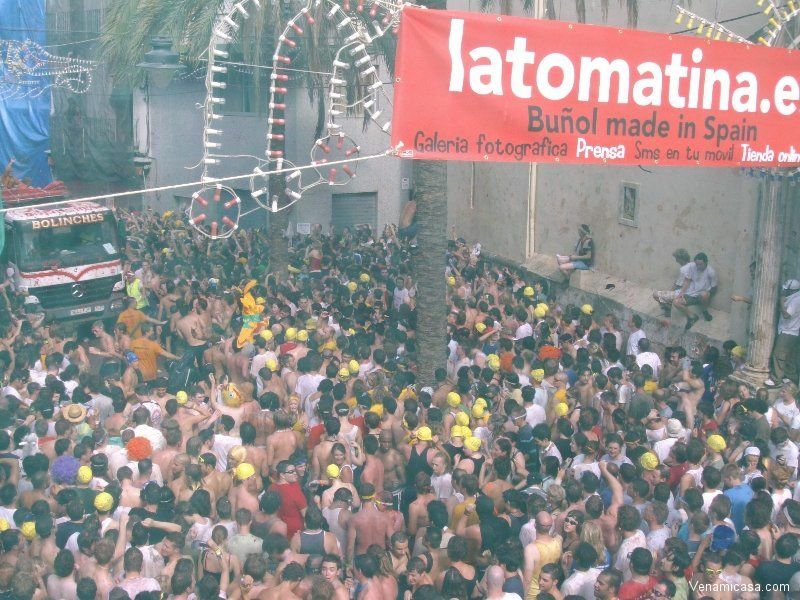 The success has led to have La Tomatina, of Buñol, be considered, as of August 2002, International Fiesta of Tourist Interest by the General Secretariat of Tourism of Spain.